We are almost in the middle of December and I am still adding a few key pieces to our, other wise complete, holiday decor. 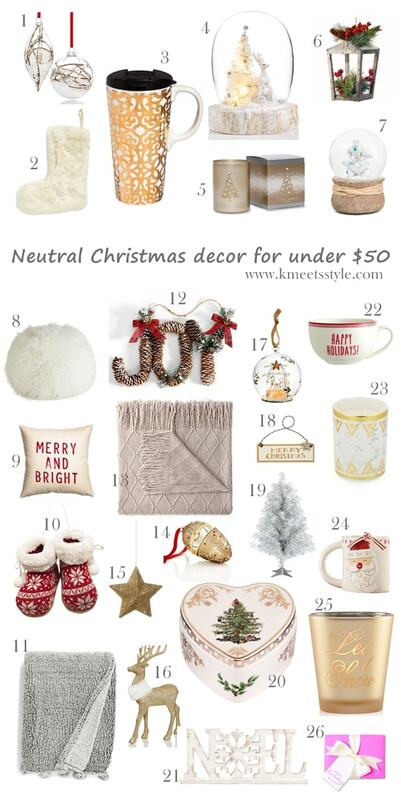 Personally neutral tones are my top choices and this season is no different. Even though I occasionally add a few traditional touches like these boots ornaments (only $12) I mostly prefer softer ,pastel shades to complement the color of our living room and bedroom . No matter if you follow the same passion as me , you can surely find something extremely chic and classic like these Lane Birch ornaments collection ($7) or everyone's most trusty holiday decor piece, the snow globe (under $20) to step up your holiday decoration game this year. There is nothing more important that having a cozy home to go back to every night and for me, being wrapped in a warm blanket like this JCEenney Reims throw (now 50% off) while catching up with my favorite tv-series ( Which by the way is currently the Stitchers ) is something really therapeutic. Another thing I could write 10 'Christmas decor ideas ' posts about is coffee table decorations. Starting with a few of my favorite candles at the moment Nordstrom's tree icon candle ( 48% off) and 'Let is snow' votive (only $6) which are by far the cutest Christmas candles I found this year . What's more common to spot on a coffee table than an actual coffee mug? I drink coffee throughout the day and if you take a look at my instagram , you will see all the cute Christmas mugs I currently use to enjoy my coffee every day. Unfortunately there are sold out but this Santa mug (for under $20) and Happy holidays for $5 designs are equally cute and eye catching . Lastly everyone's favorite subject. Christmas tree ornaments. Even though we use and re use the same ornaments as a family tradition I always add a few new pieces every year , preferably a few statement ones like this globe ornament (under 20$) or this even more unique gold egg ornament (only $6) . If you prefer something more classic take a look at this horse ornament for $8 and this Eiffel Tower globe from Neiman Marcus ( $21) . As much as we might love any modern Christmas decor idea sometimes we need to add a few traditional touches just to bring back all the childhood memories. DO you need more decor inspiration for this season? Visit The Holiday Shop and scroll down to -Home Decor-.